Oriental Lilies, or Oriental Hybrids are colorful fragrant flowering bulbs that come in a range of brilliant colours, they are well suited to grow in the garden but are often grown in pots or containers, dwarf forms are generally best for growing in pots. Oriental lilies (picture right) grow well in a slightly acid soil and prefer a humus rich moist soil. Protection from hot afternoon sun is best. Stake taller growing varieties of Oriental Lilies and try to provide protection from strong winds. So a position in a semi shaded area with a well mulched soil, in the ground or in containers will suit most oriental lilies . Spent flowers can be removed as they die off but foliage should be retained until it dies back so that energy for next years flowers is provided. 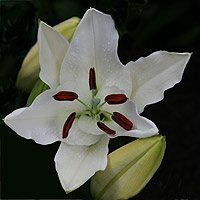 We like to grow Oriental Lilies in the garden border and they do make a great flowering garden plant as well as a long lasting cut flower, they are widely used in flower arrangements and bouquets . Blooms will last 1-2 weeks depending on conditions. Flower colors vary greatly with lots of hybrids and cultivars available, from white through pink (picture right) to red in pure colors or flecked. Oriental Lilies are some of the most colorful lilies widely available, they are mainly hybrids and can vary in color from a pure white through to the deepest crimson red, easy to grow and early to flower. 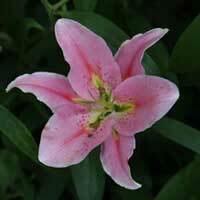 Grow Oriental Lilies in a position in the garden where they receive some protection from the hot afternoon sun. A humus rich well drained soil is best and taller growing varieties are best provided with some support. Oriental Lilies will form a clump and dividing or transplanting can be carried out in early spring when the soil begins to warm up but before growth begins. Fertilize in spring and again just after flowering to promote bulb growth.